The "Hammer Out The Hate Tour"
HAMMER FIGHT are a bunch of whiskey-drinkin', beer guzzlin' bros who spawned from New Jersey. PRODUCT OF HATE are crushing American Metallers that hail from Kenosha, WI. So what happens when you add HAMMER FIGHT to PRODUCT OF HATE? 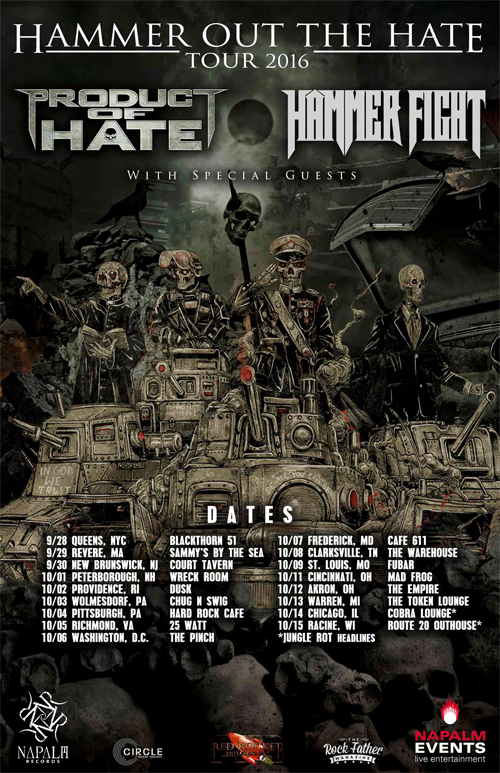 You get the "Hammer Out The Hate Tour", featuring two of Napalm Records hottest up and coming bands! "We are very happy to announce our upcoming co-headlining tour with label mates, PRODUCT OF HATE. We'll be hitting some markets we've never played before and coming back to rage with some old friends. Check the dates, find a show near you, and come experience the rock n roll party of the year", says HAMMER FIGHT. PRODUCT OF HATE's Adam Gilley added: "We are honored to be going out on the road with our label mates, HAMMER FIGHT. It will be quite the good time touring with these fine gentlemen, and we can't wait to get back out on the East Coast. Hopefully we'll get to see a lot of familiar faces and old friends, along with those who our just discovering our music. We're so eager to get on stage and crush it! Drink 'em up!" Don't miss the "Hammer Out The Hate Tour" This Fall!